An Introspective Look at Self, Emotion, Spirituality and Talent of an Artist. Some of you may have noticed that I have been posting messages and mini-blogs on Facebook and wondering what may have come across Giftus because what you read sometimes does not seem to mirror the person you have known. I, too, have somewhat taken note-surprising?-but usually things happen, as many of you may know, as we go through changes in life. These changes sometimes bring out our true personalities that have been dormant or on the low side, for a while, whether good or bad. At the beginning of 2012 I had to deal with some unfortunate situations that somewhat forced me to take a look at my own religious, emotional, spiritual and physical self. Four years before that, I was laid off from a job that I had been at for 21 years and I found myself having to join the list of unemployed looking for work. It was a mind-boggling experience, not because of the fact that I had lost my job, but I was appalled at the manner in which those searching for jobs were being treated by employees at those job centers. Sometimes, I felt they were glad at our plight because it ensured that they had a job. To me the saying…”There is money in confusion,” did not seem more real than I experienced then. But I had to get into a program to get some benefits, so I became somewhat more of a statistic than a human being. That situation forced me to look deeper into whom I was and where I was headed. It all depended on me regardless of how those employees behaved and how frustrated and angry I had become. I was the one who had to make the decision about my life. What did it matter to them to mass us like cattle? I guess nothing at all. Though I pray no one goes through this, and I pray I don’t go through this again, we all know it is a revolving door and nothing has changed. In fact it seems to be getting worse. After those two life changing experiences, I decided to have a bigger view, as we say in photography, “an ultra-wide fisheye view rather than a telephoto view,” of life and what is important. I know this is relative, but it is real and unless we deal with it, with what lies at our own doorsteps, we may fall and may never get the opportunity to rise up. I know that as an artist, I have a responsibility to myself to use the God-given talents that I have been blessed with: writing, photography and painting, because if I don’t, it will be a wasted journey. I have been given a second wind and I am setting sail on the open seas. I realized that as an artist I have to share my talents with those whom I interact and share my joys, and my sorrows, too; my high points and low points, with them. I was somewhat embarrassed when my two children, Mandisa and Jamal, felt disappointed that I had somewhat robbed them from seeing me work on an easel and canvas. They knew I wrote books but had never seen me sitting before an easel. However, I feel good that at least, they can now share the moments with me, though I know that I can never make up the time that we lost. I try not to be vain or boastful about my abilities, but I get a lot of satisfaction, knowing that I can do what I am capable of doing. I am in no way a “maestro,” at any of those artistic disciplines, but I feel good enough that others can admire what I do. I don’t take those gifts for-granted. I have also become a lot more at peace, so to say, with my own spirituality and I don’t mean, religion. I am Catholic, been involved quite a bit, but I am speaking about the way I feel about my connection with the Most High. I am no evangelist or preacher and do not force my beliefs on anyone, but having come to grips with that aspect of my life and seeing it as an everyday part of my personal life, has helped me to appreciate my role as a husband and father, most of all. It has helped me focus more on what matters; what is priority. I don’t step on anyone’s toes, so I do not need anyone to do that to me in their quest to derail me. We all have a mission to accomplish on this planet; some we chose; some were handed down to us; some were forced upon us. But it is how we carry out that mission that matters in the end. How we use the creative talents that we have to bring change; bring a sense of belonging; create a sense of pride, is what we will have to answer some time down the road. I have had time to stop and smell the paint on the canvas before I lost that ability and though what forced me to that point was a heart-wrenching event; what it forced me to do has been a life changer in many respects. I had allowed a job to take away my personal joy while trying to pursue that joy in another way. My daughter once asked me as I was about to leave for work one night. (I still can’t understand what caused her to ask that question.) “Daddy, what do you prefer? Your job, or your family?” I was surprised at the question and tried to answer it the best I could, but was this a time to stop and re-evaluate myself? Maybe it was, but we’ll never know. So I move on and thank God for the opportunity to turn things around. I know that being an artist does not give me a license to slander or demean or degrade anyone through my art. What it does is it gives me the opportunity to share what I love and helps me create art that is enjoyable or art that evokes certain emotions and feelings in my audience, young or old, rich or poor. I recently met one of my former students, whom I taught at the St. Mary’s Academy, at an event in New York. He indicated to me that images of paintings that I posted on Facebook were therapeutic to him. I could not understand where he was coming from until he told me that he had experienced a life threatening medical condition and the artwork was helping him in his recovery. I became very emotional when he explained what he had gone through and his process of rehab. What better than hearing this from someone like him? Someone whom I know personally. If I do nothing else but having helped him that way, I feel glad that I have done this and I will never forget that moment. This came from someone who identified with what I do because it became personal to him. I recently met with the Phenomenal Women Book Club of New City, NY. 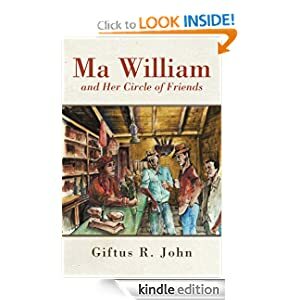 My greatest eye-opener was the manner in which almost every member of the club loved the book because they identified with Ma William-the shopkeeper. They were able to re-live their younger days through the characters since a number of them had had interaction with a shopkeeper either directly, or indirectly. Some indicated that they remembered doing some of the tasks that Bamboo did in the shop in their own shops. Some also expressed their fondness for the troublemaker…well, not surprising. When I created the characters, I never imagined how he (Bamboo) would have been able to weave himself into the readers’ hearts; but he has. Another reader told me she was sad that the story came to an end because she would not get to read about Bamboo anymore. Well, with his way of being slick, sly and very witty, he was smart, though not too intelligent, yet he got to have things his way in his village. I may not have written a bestseller, but I am very happy that I have written a book that has brought a smiles to peoples’ faces. Isn’t this priceless? I think it is. All this makes my literary journey what it has become and what it is. Extremely worthwhile. Extremely self-satisfying so far…well not financially profitable yet…The old saying…artists die poor, still resonates loudly, but I do pray that someday I will be rewarded financially and will not die poor. I have bills to pay, I should say. Artists usually have to spend before we see results of the work we create. However, to accomplish the goals I have set for myself, and to continue being the person that I should be, I need to have my spiritual, physical, talented and emotional self, all synched together or it may be a wasted journey; a fruitless journey. That is not an acceptable or desirable option. It is left to me to stay the course and use my talent, not as show, but to show my audience the beauty of what I capture on canvas, on paper and on “film” well now replaced by disks. If I can do that then I will feel satisfied in my quest to achieve the best for this guy from St. Joseph.